It's been a while since I've posted, although I'm still reading pretty steadily. So instead of one long review, I'm going to ease back in with short notes on some recent reads. First up, I read the first two delightful books in the series The Incorrigible Children of Ashton Place. In the first book, The Mysterious Howling, 15-year-old Penelope Lumley takes her first governess position upon leaving the Swanburne Academy for Poor Bright Females. In the second book, Penelope and the children visit London for the first time. (The cover of the second book is to die for!) I love Penelope's poetic-yet-no-nonsense soul, and the charm of these children who end words in tapered-off howls, such as when they call Ms. Lumley "Lumawoo-oo." These books aren't the slightest bit realistic, and they don't have the amount of closure that I normally want in books, but they're so wonderful that I just don't care. Another recent read was Thicker than Water, the fourth book in Mike Carey's Felix Castor series about a hard-boiled exorcist trying to keep it together while both his personal life and London-in-general continue to detereorate in terms of undead activity. This isn't your standard approach to zombies and werewolves, however; some of them are practically upright citizens, or at least don't particularly want to cause madness and mayhem. In any case, this fourth book bogged down a bit in the middle, and I'd almost made up my mind not to seek out the fifth book, but then this ended on a big reveal and a big bad development, so now I'm going to have to keep on with it. I hope the fifth book has the closure I'm looking for since there is no sign of a sixth book. Around Christmas, I like to read a few Christmas-related books. This year I tried I Am Half Sick of Shadows by Alan Bradley, a Flavia de Luce cozy mystery. I was intrigued by the Tennyson-inspired title, and I thought the feisty 11-year-old heroine might be spunky like Theodosia Throckmorton or Kat Stephenson. And Flavia was spunky, but she was also riddled with contradictions: she's an 11-year-old who plays with explosive chemicals and Bunsen burners, but she still believes in Santa Claus, and her attempts to chemically catch Santa in the act are silly and serve little other purpose than to put Flavia on the roof at a key point in the plot. A big mystery in Flavia's past in hinted at; considering that this is the fourth book in the series, the author is being pretty stingy with information (although to be fair, I haven't read the first three books). My guess (possible spoiler if I'm correct) is simply that Flavia's mother died giving birth to her, or gave up her life in some other way to protect her baby, and this is what causes the sibling tension in the house. It's definitely not enough to keep me interested, I'm afraid. I can't go into much detail on this next book since I was contracted to write a lengthy essay on it, but I do highly recommend 1Q84 by Haruki Murakami if you're in the mood for something different. At almost 1,000 pages, this is no quick read, but rather a slow yet fascinating examination of an alternate 1984 in Tokyo and how it affects the two main characters. Finally, a nod to an absolutely adorable picture book that I've already bought for one nephew and plan to buy for another in the future: Shark vs. 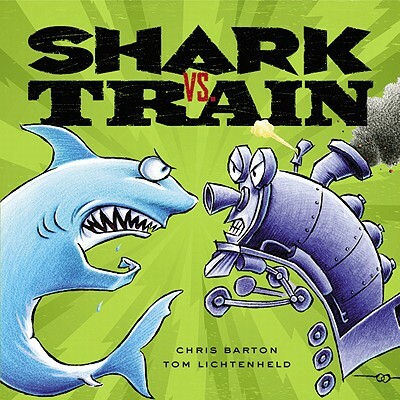 Train, written by Chris Barton and illustrated by Tom Lichtenheld. This book is about two little boys who go to the toybox and pull out a shark and a train, which they then pit against each other in a series of escalating silly contests, like which would be better at jumping off a high dive, which would be better at basketball, and so on. 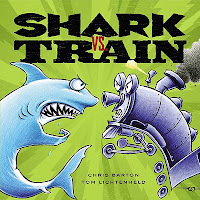 The shark and the train smack talk each other throughout, making this a witty book that parents won't mind reading more than once. Read more!